This past weekend, I had one of the most marvelous weekends of outdoor playtime a girl could ask for. Fortunate enough to have access to a cabin to crash in up in Fannin County, GA, I was surrounded by Appalachian goodness. Saturday morning started off right: with a bold, fresh cup of French pressed coffee and some sprouted grain toast, smothered with North Georgia Mountain Honey (literally world renowned honey! www.mtnhoney.com). Topping off my coffee, we packed up the car and drove a short way up to Woody Gap, as the temperatures rose quickly from the brisk 40 degrees left in the wake of a springtime mountain evening. Still a bit lethargic from breakfast (and perhaps a few too many chocolate covered almonds), I headed north towards Blood Mountain. It didn’t take long to settle into that old familiar feeling of just “being” in the mountains with the surreal weather, wildflower lined trails, and friendly hikers. With a forecast like the one called for this past weekend, surely the trail would be packed, though never did I come across an individual where the response was any more adversarial than a silent nod of acknowledgement. Day two of the dreamlike weekend lead to much of the same, though this time fancy pancakes and a Hawaiian dark roast preempted some lovely miles on a different section of the Appalachian Trail. Afterwards, as I sat in the creek at Three Forks icing down my legs and basking in the run-induced high, I started thinking: why don’t more people come out here?! Pairing sparse stories of sensationalized trail horrors with a little bit of old-time thinking, it doesn’t surprise me that people, especially women, are concerned about venturing onto the trails. Without Davy Crocket or Jeremiah Johnson to come to our rescue, what’s a girl to do out in the wilderness besides wilt like a daisy in the Georgia heat? Surely you read my sarcasm. Yet, as outrageously sexist as that sounds, I still come across very few women in my trail running adventures. Not only in rambles through more remote national forests, but even at big trail races, where plenty of company, marked courses, and aid stations along the way should set up the perfect environment for first-timer or veteran alike. Yet, female participation in trail races in the Southeast lags between 9% and 30%, which is far less than distance-matched events on the roads. That being said, I think a large concern is in venturing into the woods in training for these races, rather than the races themselves. With a Texas-Chainsaw-Massacre-esque image in our heads, I think many of us often eschew the woods as a place for the bears and only the bravest of souls. But why do we hold those fears? Just a few days ago, I was listening to a report on the radio about a high speed chase that ended in a shootout in the median of I-20 in Atlanta, like it was 1881 at the OK Corral. This story overshadowed the typical daily news of armed robberies, theft, and other unmentionable crimes. So, is the magnitude of our concern for safety on the trail relative to that in the city well placed? These stories are often so sensationalized that we’re accustomed to thinking the “unknown” that the trail holds is too risky. Just to be clear, I’m in NO WAY advocating reckless disregard for preparation and precaution. The experience undoubtedly sets up many potentially dangerous situations, but if we recognize the risks and plan accordingly, the rewards are fantastic (ask me exactly “how fantastic” right after a good trail run, and I’ll probably be too high on life to give you any more coherent of a response than a flower child at Woodstock). Here are a few things I’ve learned to take into account when planning my adventures. Gone are the days of having to rely on word of mouth to plan an adventure packed weekend… we have the power of the internet, people! There are TONS of resources out there nowadays, including some great ones that give a local’s insight to finding the best hidden gems of the area (Check out RootsRated!). Of course, nothing can replace a good old-fashioned map, especially as a resource to take with you. A badly sprained ankle is a lot easier to manage when a forest service road escape route can lead you to help and/or your car (and/or a cold beer…umm… ya know, for use as an ice pack) faster. 2) Let someone know where you’ll be. We all know the stories of lost or injured hikers stranded without anyone knowing their whereabouts. Share your plans with a significant other, roommate, or friend (if your dog is your best friend, consider your next best friend with opposable thumbs). Pro-tip: social media does not count! We all love to make our friends jealous with killer pics from the summit of Rabun Bald or your peak of choice, but save the sharing until after you’ve left the trailhead. Alerting the world wide web of your specific whereabouts in real time could set you up for some opportunistic trouble. A few extra ounces of gear won’t seem so heavy when a sudden change of weather leaves you shivering, feeling half-naked on the backside of a mountain. Unlike road-running where racers toe the line in skimpy singlets and split shorts on a thirty degree day, trail running requires more weather appropriate dress. Not only is there the safety issue from being farther away from a warm place, but performance and enjoyment is affected when you’re wasting energy trying to keep your core temp up. One of my favorite pieces of gear is an easily-packable, lightweight, water-resistant windbreaker that’s surely saved me many a time. Check the forecast before you head out and use your judgment with extra layers, a hat, and gloves, but always remember a map, water (and, depending on length of your run, possibly a means of purifying your water), and food. Throw these things in a waist pack or running vest, and it’ll hardly feel like anything (check out Rock/Creek for some tried and tested top-notch trail running gear, designed specifically for the sport). You may consider bringing your cell phone (especially for those summit selfies! ), but don’t count on it as your only means of getting you out of a sticky situation. Batteries drain quickly searching for a signal and may find no signal at all in more remote wilderness areas. Pro-tip: turn your phone off or put it in “airplane mode” to save the battery if you do choose to bring it along. 4) Know the real dangers and plan accordingly. Most crimes are those of opportunity, which means take extra precaution at the trailhead. Put wallets, GPS devices, chargers, sunglasses, and even bags either in the glove compartment or out of sight before locking the car. Even if you know your knockoff, gas-station Ray Bans are only worth $2, someone looking for a quick grab right off the highway might not know that. Always be aware of your surroundings. If the scenery and stimulation along the trail aren’t enough to distract from the long training run ahead of you and you choose to wear headphones, consider only using one ear bud and/or keeping the volume very low. This will ensure you can hear other hikers/runners/bikers/horses as well as other warning signs like thunder or noises from nearby animals. Most often, any animals you will encounter on the trail are not on the offensive: they’re more afraid of the giant human barreling down the trail than you are of them. However, being aware of their presence and giving them space can save you some trouble, while still allowing you a front row seat to an awesomely entertaining adventure. 5) Stay on marked trails. Throughout several cross-country road trips as a kid, my dad used to make my siblings and I write journals and take “quizzes” following ranger programs at the national parks; something we groaned about then, but (maybe a tiny bit) appreciate now. I always remember a question about the cryptobiotic crust in Arches National Park for the oddity of this natural occurrence: the soil is essentially “alive,” as the cyanobacteria contained in these dust clumps stabilizes the ground, preventing erosion while it simultaneously retains water and nutrients for plants thriving in the harsh desert conditions. The park guides and trailhead signage sternly warn against stepping off trail, as human impact would disrupt this delicate symbiosis. While the Southeast is no desert (cue summer humidity), we shouldn’t neglect the impact of straying from designated, marked trails. Not only do we risk damaging the ecosystem to which we are guests, but it also sets up another risk in the difficulty of finding a lost hiker/runner who has strayed from a marked path. Most importantly: Have fun. Pick a trail, lace up, and give it a whirl! Tired legs, tales of adventure, and lots of smiles are guaranteed. What trail safety tips do you have to add to the list? Let’s hear from the ladies: what, if anything keeps you from hitting the trails? Fill out our survey and let us know! What a fantastic article. I have run on trails only a few times. I’m a street runner. This article is reminding me how much I enjoyed those trail runs. And what a good point about how many things can go wrong running on the streets! 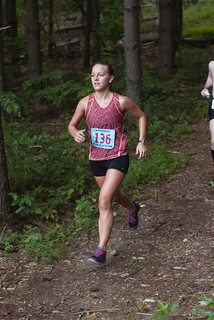 Erin’s enthusiasm for running spills out in this article. What a beautiful perpective! Great article. Only until recently have I strayed away from solo trail running. Now that it’s my norm I make sure to let someone know where I’m at, bring the cell, a map, and some snacks. You find the best adventures by “getting lost” in the woods with yourself or a friend. I find trails are significantly more safer than roads and the real threats are more of potential injury than animals or people around us. The statistics of getting hit by a motorist on a road are far higher than a mountain biker on the trail. Thanks for the good read! Great article. I agree that many, not just women, lose out on the incredibly therapy that is the outdoors. I would add a few suggestions to the tips listed above: 1) avoid running with headphones or just have one in at a reasonable volume. Being aware of your surroundings is essential to your safety and hearing what’s going on around you is a major factor in staying safe. 2) why not take a self defense and/or survival course? Give yourself the tools you need to feel confident so you can enjoy the outdoors you’re entitled to.